So You Want To Make A T-Shirt Quilt! While T-Shirt Quilts of Texas would love to make a custom t-shirt quilt for you, sometimes you just gotta do it yourself! We'll walk you through the basic steps. Should You Make Your Own T-Shirt Quilt? So, you know just enough about sewing that you want to try it yourself. Great. Here are some things to consider. Rotary cutter and mat. 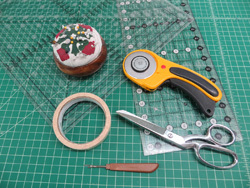 You can use scissors, but you need the rotary cutter to get an accurate cut before piecing. Time. Allow 30 - 60 hours depending on your skill and comfort level. T-Shirts. - The more the merrier. But, keep it under control. BIG is heavier and harder to manage. 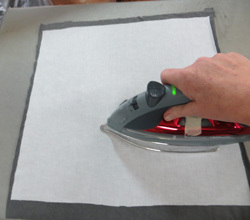 Fusible Interfacing - This is what makes the t-shirt fabric manageable. Don't skip this step. Whether you or a professional quilter is quilting this, this makes the t-shirt fabric easier to work with. Without it, your quilter has to spend more time making the the t-shirt fabric lie flat and even. Fabric. Amount depends on size of quilt. PLEASE use good quality fabrics. Don't spend all the time creating this quilt using low quality fabrics. Batting/wadding. This is usually a 80/20 blend of cotton and polyester, or some folks will use a 100% poly. Your choice. 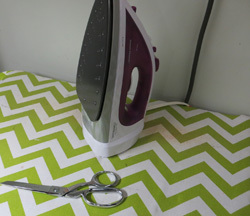 Iron and ironing surface. We use a professional iron press here in the shop, which only takes a couple of seconds per shirt. You will probably have to use a domestic iron. Just follow the product instructions and apply to back of t-shirts. Plastic Square Ruler. Optional, but very helpful to size your blocks. Lay out the t-shirt pieces into a pleasing design. If you are using sashing, add that to either one side or the bottom of the shirt squares (except the last on in the row/column). Add borders if desired. (We get a LOT of t-shirt tops. Many times they have us select the backing and add a border to match the backing). Quilting. Next, you are going to turn the 'top' into a quilt. A quilt is defined as 3 layers with some sort of stitching holding those layers together. Probably the easiest way to do this is to send that finished top to your longarm quilter. 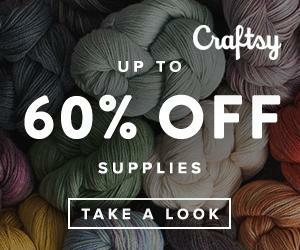 She will probably have batting and backing fabrics available for your convenience. If budget does not allow for a professional longarm quilter, then you can either quilt it on your machine or 'tie' it. We don't recommend tieing it, as the quilt won't be very stable and won't stand up to laundry over time. Binding. The last step is binding. That is the step to finish all the raw edges of the quilt. Again, your longarm quilter should be able to take care of that for a reasonable charge. There you have it. T-Shirt quilts in a nutshell. Basic sewing supplies. Rulers, rotary cutter and mat. Seam ripper. Masking tape. 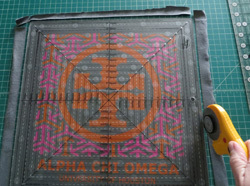 Square up the t-shirt square with plastic ruler and rotary cutter for accuracy.